(TNS)—Sitting down to do your taxes in the next few weeks—or talking with your tax preparer—will involve tackling the most sweeping changes in the federal income tax rules in more than 30 years. Tax filers need to keep in mind that more than 600 changes took place under the Tax Cuts and Jobs Act, which was passed by Congress in late 2017. Will things end up being simpler? Maybe, if you’re able to tap into a substantially expanded standard deduction and you no longer must string together all sorts of receipts and paperwork to itemize deductions—or maybe, if your upper-income household can now skip the highly complex and much-dreaded alternative minimum tax. “It’ll be a little bit of a surprise and a learning process as they file their first tax return under the new tax rules,” says Joseph Rosenberg, senior research associate at the nonpartisan Tax Policy Center in Washington, D.C.
Tax filers will be asking more questions, but they might have a harder time getting answers from the IRS, given all the challenges relating to the shutdown and the new tax rules. As a result, it makes even more sense to start early, and not wait until days before the April 15 tax deadline. All individual taxpayers will now use the same 1040 simple form. It replaces the old 1040, the 1040A and the 1040EZ, according to Mark Luscombe, principal analyst for Tax & Accounting at Wolters Kluwer in Riverwoods, Ill. But it doesn’t end there. Supplemental schedules would be used by many taxpayers, such as if you itemize deductions or qualify for a variety of tax credits other than the basic Child Tax Credit. Logical question, given that many of us have heard about a much higher standard deduction under the new tax rules. But there’s no simple answer. “You still want to run your numbers both ways,” says Jackie Perlman, a tax research analyst at H&R Block’s Tax Institute. Roughly 10 percent of tax filers will itemize deductions, such as the interest paid on their mortgages or what they paid in property taxes, on their 2018 federal income tax returns, according to estimates by the nonpartisan Tax Policy Center. That’s down from about 30 percent in previous years. Families who own a home, in particular, will want to review whether they’d still itemize to lower their tax bill. You’d need deductions to exceed the new higher, standard deduction, which is nearly double from a year ago. And you’ll face new limits relating to the deduction you can take relating to state and local taxes, such as for what you paid for property taxes and state income taxes. Married couples filing jointly are looking at a standard deduction of $24,000 on their 2018 federal income tax returns—that’s up $11,300 from the old amount on the 2017 tax returns. Single filers are looking at a standard deduction of $12,000—up by $5,650 from the old amount on 2017 returns. If married filing jointly and you or your spouse are 65 or older, you may increase your standard deduction by $1,300. If both of you are 65 or older, the additional standard deduction goes up to $2,600. If you file single or head of household and are 65 or older, you may increase your standard deduction by $1,600. For someone who is 65 or older and blind, both additional deductions would apply. Will I get any tax break for having children? Most parents across the country with young children or teens will be able to tap into the child tax credit on their 2018 federal income tax returns—even if they couldn’t use that credit in the past. “The child tax credit got supersized,” says Mark Steber, chief tax officer for Jackson Hewitt in Sarasota, Fla.
Another plus: Now, up to $1,400 per child is available as a refundable credit for those with earned income of more than $2,500. As a result, some families can get refunds even if their taxes are zero. Couldn’t take the credit last year? OK, but new rules apply and more people will be able to take the credit now. The income threshold jumps all the way to $400,000 for married filing jointly and $200,000 for others before any phaseout. Under the old tax law, the adjusted income limits were far lower: $75,000 for singles; $110,000 if married filing jointly. The supersize credit, though, will be needed to offset the loss of personal exemptions for families with children. “We lost the $4,050 dependent exemption,” Steber says. In the past, taxpayers could take an exemption deduction for themselves, their spouse and each dependent they could claim. Each personal exemption reduced gross income by $4,050 on 2017 returns. The exemption phased out for higher earners. For this credit for other dependents, the dependent does not need a valid Social Security number. An Individual Taxpayer Identification Number or Adoption Taxpayer Identification Number would work. No, but some will face new limits. If you live in a high-tax state or possibly own both a home and a cottage at the lake, you’re going to want to pay extra attention to one major change on 2018 returns. We’re looking at a new limit on how much you can deduct when it comes to what you paid in 2018 for state and local taxes. For 2018 through 2025, the deduction is limited to $10,000 (or $5,000 if married filing separately) for individuals who paid state and local real estate taxes, personal property taxes and income taxes. “If they haven’t been keeping up with the news, they might be in for a surprise,” Perlman says. Middle-income and higher-income families who live in states such as California, New York, New Jersey and Illinois may be particularly vulnerable. Generally, states with both high average incomes and higher-than-average state tax burdens would be impacted. But remember, if you paid $12,000 in state and local taxes, you’re still looking at a $10,000 deduction—if you itemize. So you don’t want to entirely write off the possibility of itemizing deductions. “It really depends on your personal individual circumstances,” says Jennifer Lowe, senior director of Research and Learning at Wolters Kluwer. The AMT isn’t dead, but it’s not the monster threat that it was for so many well-off taxpayers. Many will no longer be subject to the AMT in 2018 and in future years. The Tax Cuts and Jobs Act raises the income cap so that fewer people will be impacted. The AMT taxable income exempted from AMT goes up to $109,400 for married filing jointly from $84,500. For single taxpayers, the income exempted goes up to $70,300 from $54,300. An even more important change was that the new tax act significantly raised the income level at which the AMT exemption begins to phase out. Now the exemption from the AMT begins to phase out at $1 million of AMT taxable income for joint filers, compared with $160,900 on 2017 returns. The phaseout is $500,000 now for single filers. The AMT was created in 1969 to ensure that high-income taxpayers paid a minimum amount of tax and didn’t benefit too heavily from deductions. But over time, more households were caught in the tax mess. Now, the AMT will impact about 0.4 percent of households with incomes between $200,000 and $500,000 on 2018 returns—down from 27.2 percent on 2017 returns, according to the Urban-Brookings Tax Policy Center’s estimates. Will my refund will be smaller? Will I owe money? “Whether you owe taxes or not is really going to depend on your individual situation,” says Lowe at Wolters Kluwer. One word of warning: The tax withholding tables changed in early 2018 to reflect lower tax rates and enable people to take home more money in their paychecks. But it’s possible that many people still did not have enough in taxes withheld—even with the new lower tax rates—based on their individual tax situations. 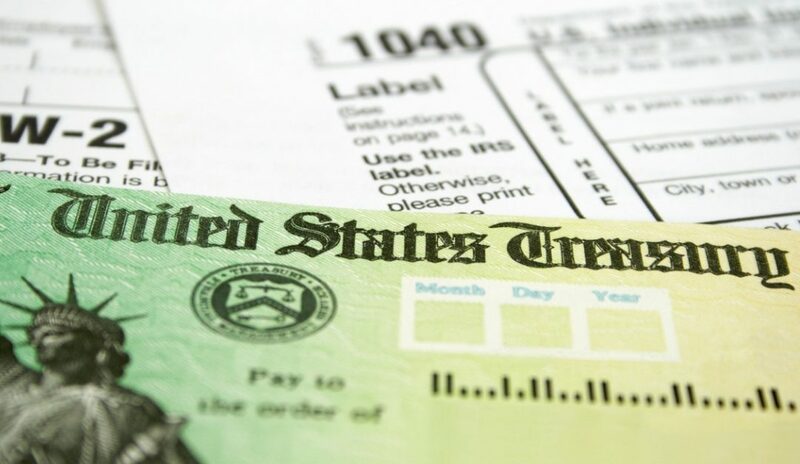 “We realize there were many changes that affected people last year, and this penalty waiver will help taxpayers who inadvertently didn’t have enough tax withheld,” IRS Commissioner Chuck Rettig says in a statement. So, yes, it’s possible that many people may owe more money or receive far less than what has been typical. But that just gives us another reason to do our taxes earlier this year—just so we know the score as early as we can. What’s missing? Say goodbye to exemptions. For some, this may be negated by the increased standard deduction. For instance, if you’re married filing jointly and you have only one child, the exemptions added up to $12,450. But the new, higher standard deduction for that same family is $24,000, which more than covers the loss of the exemptions. That’s not the case with larger families, though, says Kathy Pickering, executive director of The Tax Institute at H&R Block. “If you have a family of six…the increase in the standard deduction by itself won’t offset the elimination of exemptions,” she says. Get your employer to pay business expenses. Don’t throw away those receipts, though. Some states such as Minnesota and Pennsylvania may allow you to claim some of those expenses on their state income tax returns, Pickering says. Teachers also can claim a special educator expense deduction up to $250, or $500 for married teachers filing jointly, that wasn’t eliminated by the tax law, says Mark Jaeger, director of Tax Development at TaxAct. Planning to move? The IRS won’t be giving you any breaks. Starting this year, there is no longer a moving expenses deduction. “That’s been a pretty important deduction to be able to claim, especially if you’re moving for a new job across the country,” Pickering says. There is one exception: Taxpayers who are active-duty military and moving on military orders to a permanent location can deduct moving expenses, such as travel and lodging, transportation of belongings and shipping cars and pets. However, under the new tax law, you won’t be taxed on moving expenses your employer reimburses. “People had been surprised that those expenses were considered income,” Pickering says. Tornado or break-in? You probably can’t deduct those losses. Job search expenses: You can no longer deduct for expenses related to finding a new job. Before, those expenses could include travel costs incurred for a job interview, fees for resume and cover-letter services or fees for job-placement services—”even if you didn’t get the job,” says Lisa Greene-Lewis, a certified public accountant and tax expert at TurboTax. Some donations: If you’re a college hoops or football fan and a generous school donor, you won’t get a popular tax break anymore, says Jaeger. Before, you could write off 80 percent of a charitable donation to your school that ultimately helped you reserve better stadium or arena seats. Now that’s gone. However, other contributions to your alma mater remain deductible.